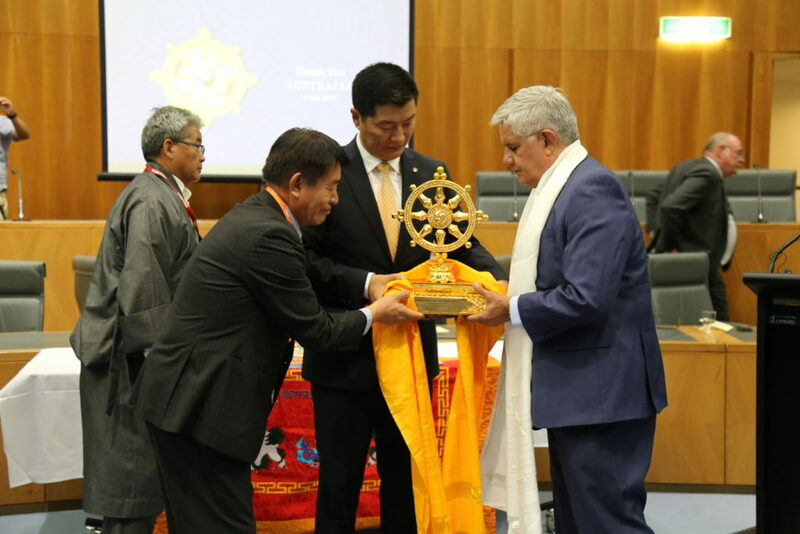 (TibetanReview.net, Dec07, 2018) – A Thank You Australia event was held in the Australian parliament building on Dec 5 with the participation of the country’s Minister for Indigenous Health Ken Wyatt AM as special guest. It was organized by the Canberra-based Office of Tibet of the Central Tibetan administration (CTA) as a part of the latter’s year-long celebrations of such events in countries across the free world where communities of Tibetans live. Also present as guests were stated to be Co-Chairs Micheal Danby and Warren Enstch of the Australian Parliamentary Group for Tibet, leader of the Australian Green Party Senator Richard Di Natale, former Minister of Defence and MP Kevin Andrews, former Foreign Minister Gareth Evans, and former House Speaker Peter Slipper. Addressing the event, CTA President Lobsang Sangay has referred to the numerous discussions on Tibet and the around 2200 statements on Tibet made in the Australian Parliament as well as Australia’s special provision of immigration to former political prisoners who had fled Chinese ruled Tibet. He has noted that the country currently hosted 2300 Tibetan immigrants, 1363 of them former political prisoners. He has said Australia “has set a good record to follow”, although the CTA is generally seen as being opposed to the severely opportunity-starved Tibetans living in India from leaving to resettle in other countries. Special guest Wyatt has said the similarity in the situation of Tibetans and indigenous people of Australia had naturally drawn strong support for the Tibetan people. Expressing understanding of the struggles the Tibetan people continued to face to preserve their identity, he has assured continued support for the Tibet cause. Natalie has expressed strong commitment towards freedom, truth and justice and such support for the Tibet cause. While acknowledging the importance of establishing and improving bilateral relation with China, he has said this must not silence the voice of support for Tibet. Other guests from across the political parties were stated to have spoken in support of the Tibetan issue. Ms Kyizom Dongdue, who represents Tibetans in Australia in the exile Tibetan parliament at Dharamsala, India, has spoken on the growing Chinese government influence in Australia, leading to a surged in discussion on the issue.